This performance utilizes strobe-like effects, theatrical haze, and loud sounds. This event will last approximately 1 hour and 20 minutes. This performance contains adult language and adult subject matters. “Hallucinatory. Psychotropic. Miraculous” (The New York Times). OBIE award-winning Andrew Schneider's technical theater masterpiece examines in micro-detail the consuming and agonizing last burst of human thought before entering the afterlife. 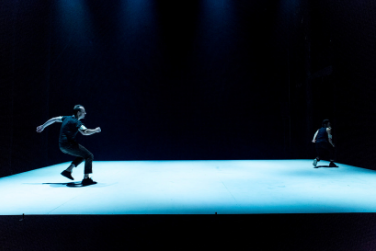 AFTER commands mind-bending light and sound effects, and pairs them with adept physical performances riddled with pathos, humor and intelligence. This sensitive inner monologue delves into the individual’s consciousness with spellbinding machinations that engage all the senses to construct a poignant clarification of where the human experience stops, how it gets there and what comes after. This performance features a prolonged period of total darkness. You are in a controlled environment, and not in any danger. If you have a personal emergency during the darkness, raise your hand and a house manager will assist you as you exit. This performance also utilizes strobe-like effects, theatrical haze, and loud sounds.